Some transpooling and installation operations require just a simple solution - that is where the Maritime Developments’ turntable steps in. 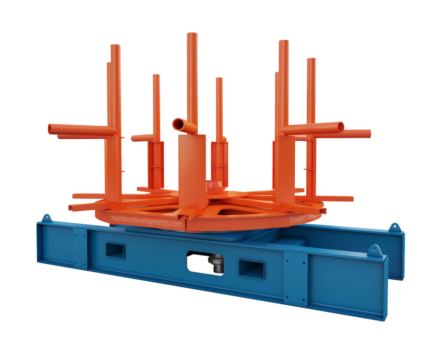 Portable and compact, the solution can deploy umbilicals and flying leads off manufacturers’ baskets as standard, and can also be supplied with alternative adapters for pallets from other providers. Powered by a dedicated HPU with quick disconnect hoses, and featuring built-in storage for spares and tools, the device is ready to go whenever you are. - a single solution for numerous applications. As well as turntables, MDL delivers the full turnkey package of back-deck handling equipment including tensioners, reel drive systems, overboarding chutes, deck winches, level winders, power units and control systems.